ESA’s contribution to the Hubble Project guarantees European scientists access to 15% of Hubble observing time. Hubble time is allocated on scientific merit by an international panel that includes European experts. 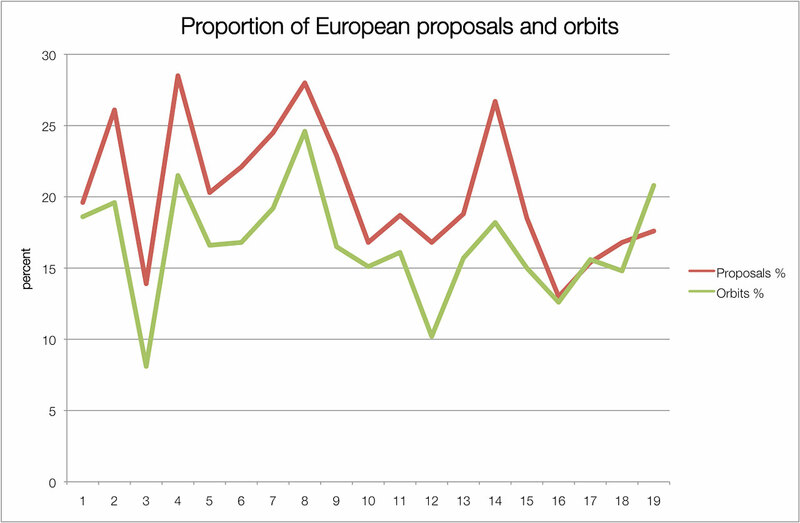 Over Hubble’s lifetime, European astronomers have, in open competition, been allocated more than the guaranteed 15%, and in some years the proportion has been closer to 25%. Europe also provided one of the scientific instruments Hubble was launched with, designed Hubble’s solar panels, and has provided astronauts to participate in servicing missions. Scientists from most ESA Member States have had an opportunity to observe with Hubble. To date, almost 800 observing programmes with European principal investigators (lead scientists) have been carried out or are scheduled to be in the next observing round, with many others involved as co-investigators. Below is an overview of the fraction of observing time that has been rewarded to ESA proposals. It is measured in two different ways: In number of proposals and in time (here measured in units of Hubble orbits, i.e. 96 minutes). By both metrics, European scientists have won comfortably more than 15% of observing time in the majority of years since launch. NB: Observing cycles are approximately a year long, and are the scheduling periods for observing time on Hubble. Cycle 18 corresponds to 2010-2011, Cycle 19 observations are currently underway, having commenced on 3 October 2011. The success of a scientific mission can be measured by the number and quality of scientific papers that are published in the specialised press. The number of papers based on Hubble observations published each year has been increasing continuously since the telescope’s launch. There is at least one European author or co-author on about 30% of these papers, indicating the importance of Hubble to European astronomy. Up until 2010, ESA jointly operated the Space Telescope European Coordinating Facility (ST-ECF) with the European Southern Observatory (ESO). This served as a support organisation for European astronomers using Hubble, and made important contributions in its own right, particularly in the areas of slitless spectroscopy, data archives and computer software. Although the ST-ECF is no longer operational, ESA remains committed to the Hubble project, and to the James Webb Space Telescope (sometimes regarded as Hubble’s successor). ESO continues to carry out Hubble education and public outreach operations (including this website) on behalf of ESA. "European astronomers will have access to ESA’s share of observing time for as long as Hubble remains in the sky. Additionally, we expect to preserve access to Hubble data via the European Space Astronomy Centre. As part of the ongoing collaboration with NASA, ESA will continue to deploy staff based at the Space Telescope Science Institute in Baltimore, USA." ESA’s interests in the Hubble project are maintained, with a contingent of European staff working at the Space Telescope Science Institute. "ESA has 15 European scientists working at STScI in Baltimore as part of its contribution to the science operations of Hubble. This European contingent has not only played a significant part in the successful operation of the Hubble Observatory, but has also often consisted of young European astronomers taking the opportunity to work in a highly stimulating environment. Many European Hubble Observers have spent periods of research time at STScI and several European students have completed their Ph.D. studies there. It is an excellent return for the investment."